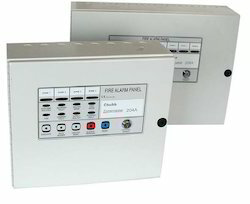 Our product range includes a wide range of conventional fire alarm panel. Owing to our proficiency in this domain, we are offering our clients a wide gamut of Conventional Fire Alarm Panel that used less frequently in large buildings than in the past; the offered alarm panel is checked in terms of quality so as to deliver a defect free range. This alarm panel is designed with sophisticated technology keeping in mind the diverse needs of the customers. We provide this alarm panel to our customers on various specifications.